A few years ago on a bright summer afternoon, I step out onto our porch and gaze beyond our back yard to the Doylestown Community Garden. The garden bumps on the other side of our property. A macadam hike and bike path separates us from this gentle piece of public ground in Doylestown. The garden shares an expanse of grass including a fenced area protecting twenty plots where Doylestown Borough residents prepare, plant and harvest to their heart’s desire. Every season we receive gifts of joy and hope from our porch as we witness community gardeners tilling the soil in their beds. On a separate piece of ground is an herb garden lined on one side with one apple and two pear trees. The apple tree, possibly 20 years old and 10″ in diameter at its trunk, stands closest to the hike and bike path. On this day the apple tree catches my eye because swirling above its crown in a perfect magical 360 degree formation are hundreds of dots. I walk down our lawn and cross into the community garden where at this close range I suspect: These Dots May Be Bees! Hundreds upon hundreds of them continue to swirl downward, still in precision formation before diving and disappearing inside the tree’s branches and foliage. I telephone the Penn State Extension Bucks County Office and ask for Agent Scott Guiser who in his free time is a beekeeper, harvesting honey at his home. When Scott arrives there are few bees diving into the heart of the tree. 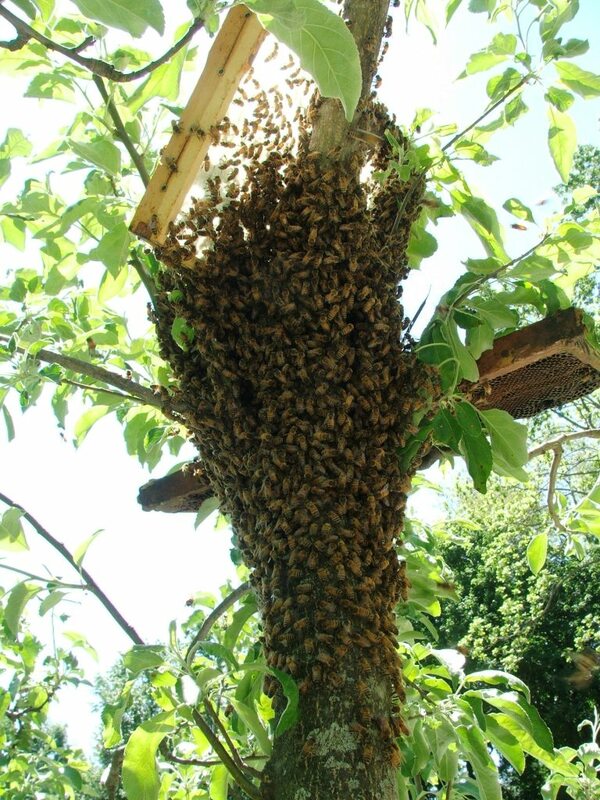 Midway up the tree trunk, wrapped in a thick knot we discover the bees in the formation of a hive. The bees are tightly tucked in the crotch leading from the main trunk. Scott confirms that this is a swarm of honey bees and adds, “I’ll have to get my gear. I’ll need a ladder and a tarp or large blanket to spread under the tree. I won’t be long.” Before leaving he tells me that somewhere in that thick clump of bees is the Queen. The tarp is in place when Scott returns. He slips into his white protective suit and hood transforming himself into an Earthly Astronaut. The smoker–a metal container shaped like a coffee pot with an extended spout is lit, spitting puffs of smoke. His most important gear is the hive, a box which he sets on the tarp at the base of the apple tree. “I have to find the Queen”. He removes a frame from the box. 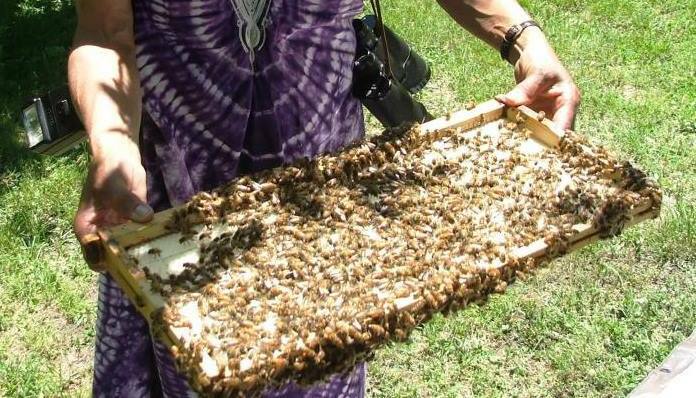 It has traces of hive odors which will attract the swarm of bees and will help them adapt after entering the hive. Scott climbs the ladder and with one puff, the bees hugging the trunk slowly fall to the tarp below. When he locates the Queen in the trunk, he gathers her and the remaining bees onto his bee brush. Very carefully he climbs down the ladder and stooping next to the little box, gently shakes the Queen and the other bees off his brush onto the tarp. Once the Queen is inside, the rest follow like soldiers. It’s hypnotic witnessing these beings Move As One. I stoop closer realizing that just beyond my back yard an entirely Alternate Universe has dropped from the sky. I have no fear being inches away from these Bees and am tempted to drop my hand on the tarp hoping they will rest on my palm before entering the hive. A few months later, Scott gifts me with a jar of honey harvested from the “community garden bees”. Those bees are and will always be part of my soul. A neighbor who lives on my street also keeps bees. Last fall I run into him and share the story about the bees in the community garden. 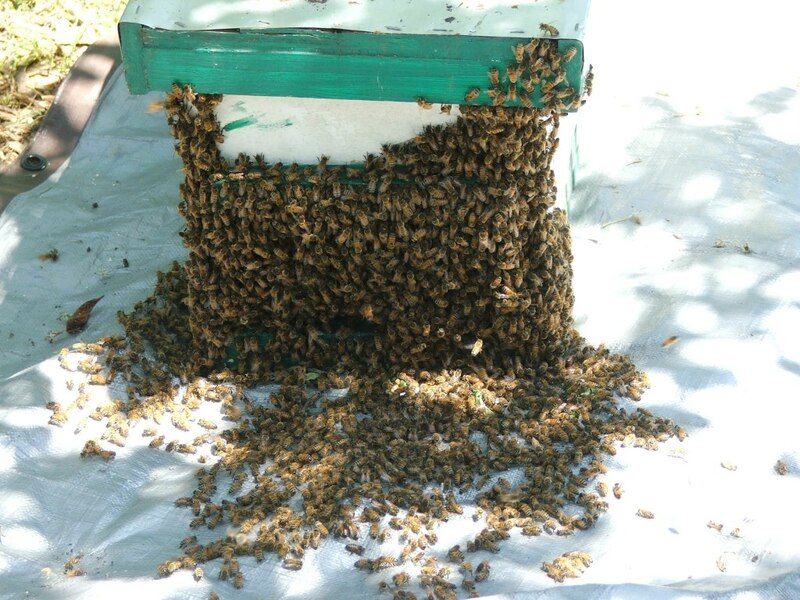 He is convinced that this swarm was from his hive, pleased to learn that they were rescued by another beekeeper. Next– my review of the book The Bees by the British writer Laline Paull.